Smart Choice has experienced rug repair specialists who are skilled in reweaving the intricate patterns and matching the antique dyes used to create these types of rugs. Your 100% unique Bokhara rug is safe in our experienced hands! The tedious and intricate designs of an Antique Bokhara rug require a very highly skilled hand for repairs and restorations. The carpet surrounding the damaged area must be pulled back to expose undamaged warps and wefts. New structural pieces are attached to existing ones. New knots are hand tied in a matching pattern with matching materials. In some cases, matching these things is harder than the reweaving itself! The rug is shorn and trimmed to match the pile length of the undamaged area. The original fringe, the ends of the warps, are pulled tightly and secured. Then, new fringe is woven into the rug’s edge and secured as well. When all of the fringe has been replaced, it is trimmed to the same length as the existing fringe. The rug is fastened to a loom or workstation. Yarn is chosen based on texture, color, and pile height of the rug. Overcasting or side binding, where the outermost warp is tightly wrapped, is done for the damaged part or for the entire side. The unique processes used to dye an Antique Bokhara rug must be recreated during color restoration. A truly professional rug restoration team will cook the dyes necessary to re-color a Bokhara rug on site. This may involve importing specific plants, insects or vegetables to ensure that the colors match exactly. Each thread is hand dyed with exactly the right amount of dye to restore its original vibrancy. To this day, the history of an Antique Bokhara rug most likely begins in Pakistan or India. 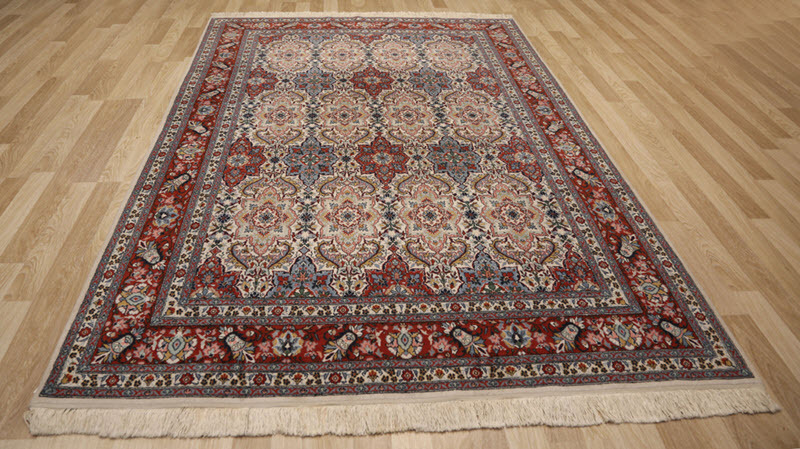 Bokhara was a trading center in Turkestan and the namesake of this type of rug. Many Antique Bokhara rugs have an intricate border with geometric patterns in the center called gules (octagonal designs), sometimes referred to as an ‘elephant’s foot’ pattern. 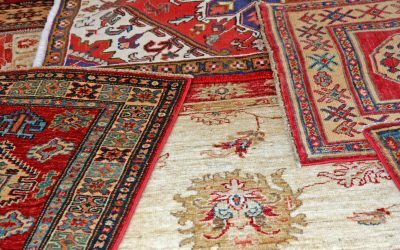 They are made of high-quality, hand-spun wool, so rug repairers must be extra-careful to match the superior technique when doing Antique Bokhara rug restoration. A large loom with horizontal wooden beams is set to the desired rug width. Warps (vertical strands) and wefts, usually made of cotton, are attached. Wool is dyed with natural materials. Vibrant reds are popular for Antique Bokhara rugs. Then it is thoroughly dried and spooled. The design can be roughly drawn on the foundation so the weavers can follow it. Persian knots are hand knotted in a double pile construction. The top wool pile is left longer than the rest so the rug feels more luxurious. Several steps are involved in completing the rug. It must be washed, blocked and stretched. If there are persistent wrinkles, it is ironed, and then it is trimmed several times to get the perfect pile height. One rug takes at least 5 or 6 months to complete, even with several weavers working every day. These rugs are very popular right now because they are durable and beautiful. Superior craftsmanship goes into an Antique Bokhara rug, including antique dying methods that use everything from berries and vegetables to tree bark! © 2019 Smart Choice. All rights reserved.